Note: There's an update to this at the end, where it says "Addendum." It sounds almost like a joke. Promise people a "killer app." Get it approved (somehow) by Apple for the App Store. Have everybody download your "killer app." Show everybody how popular your app is by showing how many people signed up before you, and how many people signed up after you. 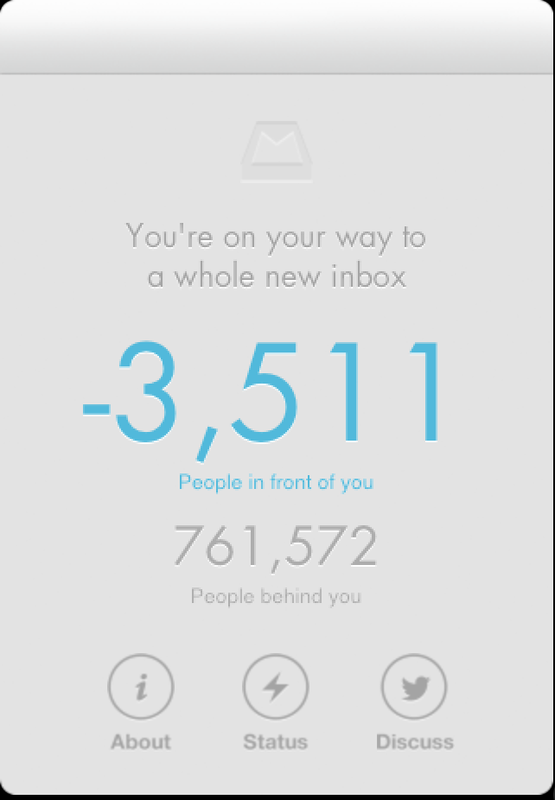 Let them know that when the people ahead of you gets down to zero, you will (finally) be able to actually run the app. Decrease the count by one VERY S..L...O....W......L.........Y. When you get to zero, do nothing. Yes. After literally DAYS of waiting for the iOS app to actually get to the point where it is supposed to work, it does absolutely nothing. Well, that big "0" in the middle of the screen sometimes actually changes. It shows a negative number (!!!) and then quickly shifts back to the big "0." The program hasn't done anything else other than show this remarkably useless screen. Looking at the app reviews for the product, roughly half of the people that rated the app gave it a "1" (I hate it) review, mostly wondering why other people were giving an app that does nothing five stars. 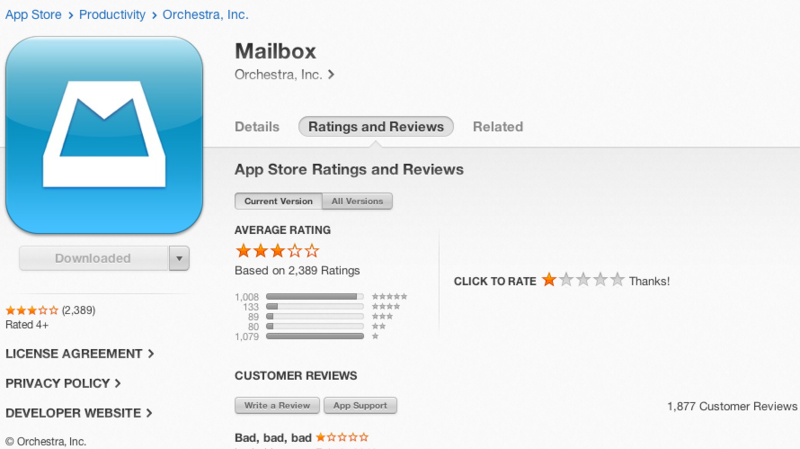 It also doesn't explain why iTunes give the app a 3-star rating. I'm not really sure where to go from here. I cannot review an app that doesn't do anything. I mean, it shows a couple of interesting numbers, but it does nothing like what the app description says it is supposed to do. To be fair, I sent off an email to the company explaining the issue I was having, and the response I received was, (and I quote), "Thanks so much for contacting Mailbox! The response has been incredible. We would love to get back to everyone right away, but due to high volume, our response time will be delayed. Thank you for your patience and understanding! Mailbox relies on servers in the cloud to do things like send push notifications, make downloading email as fast as possible, and handle snoozed messages. Software that is server-based is susceptible to being overloaded and we want to keep this from happening. This is email, after all, and it needs to work reliably. 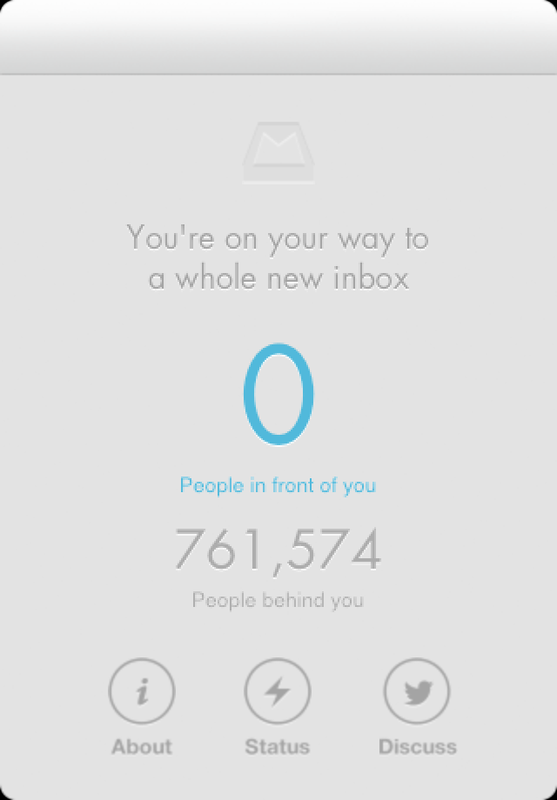 We’ve designed the Mailbox service to scale indefinitely, and have done as much load testing as we can. But we don’t know what we don’t know, so we’re using reservations to add people gradually. I contend that what they've written on their web site contradicts what they sent me in their response to my emailed query. After all, the roll out was supposed to be SLOW in order to provide better response, but their response is that they're overwhelmed. Delivers an app totally unusable for the express purpose for which it was designed. Apple has been famous for frivolously rejecting apps for the most menial reasons, but it's also known for removing apps that are misleading as well. Isn't it time for Apple to step in and say, "Hey, wait! This isn't the iOS App experience we've been promising our users!" and give these developers and their app the boot? Since I originally posted my blog entry, the Mailbox support staff have replied. They asked for additional information, including my reservation number, confirmation code, and email address. I did so, and they told me to re-enter my credentials and validation code again. I did, and was allowed into the program. So, they apparently managed to fix the problem on their end. This is an iPhone-only app. This cannot be stressed enough. In this day and age after the iPad was introduced in 2010, I'm surprised that there are still new apps that are iPhone-only. I don't like running apps on my iPad that don't run at iPad resolution. I tried to give my reservation number and validation code on my iPhone, but was told the number that worked on my iPad can not be found. My only choice, if I want to run this on my phone, is to sign up for another spot on the line, which is hundreds of thousands (millions by now?) long. The original wait for spot 87,474 was long enough. I'm not waiting for a million people ahead of me! I do most of my email on my iPad, not my iPhone. For me, the iPhone is useful mostly for quick one-liners for email (and even then, I prefer iMessage due to its better interface for such small messages). That's my opinion, of course, but Apple's tools make it quite easy to adapt an app that was designed on one platform to the other; I've done this myself as a developer! I haven't used this program much due to the above limitations. I was less apt to give it a shake, even if I was willing to use my iPhone as my mail platform (which makes little to no sense to me, since I have an iPad quite able to do the trick). I may return to the program to give it a full on review, and may even like it, but as it stands now, I'm not likely to do so. As I said, things are working now, but not because I broke something, as far as I know. My original post is still valid; I did have the issues that I wrote about.